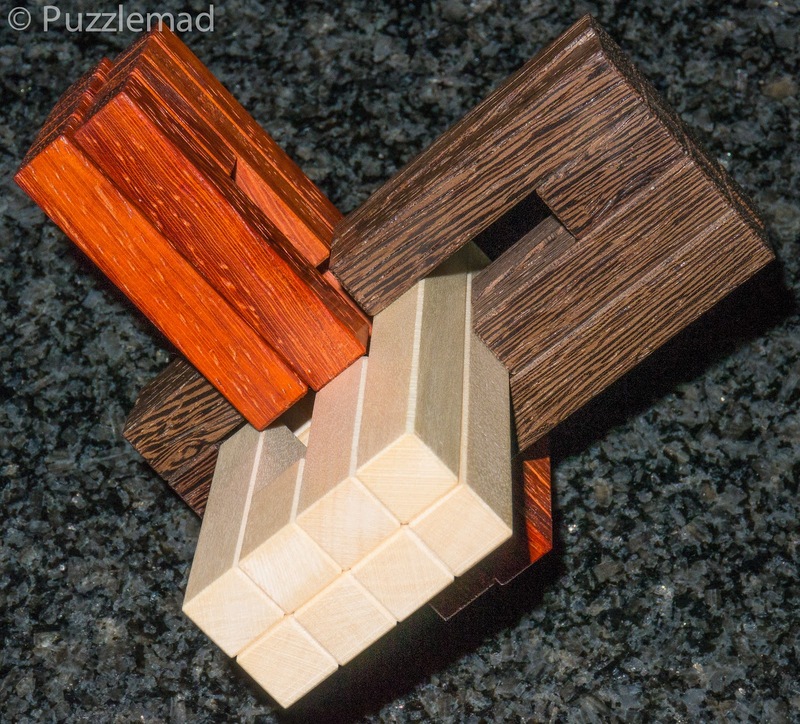 PuzzleMad: It gets easier - so I thought! It gets easier - so I thought! Last week I highlighted a few of my recent purchases from my friend Jakub, the co-owner of the New Pelikan Workshop. The puzzles I showed were fabulous interlocking solids which were a really nice little challenge and a packing puzzle that even I was able to solve in a reasonable period of time despite being rubbish at them (that puzzle is now in the hands of a true lover of packing puzzles who will really appreciate it - a birthday gift for a friend). 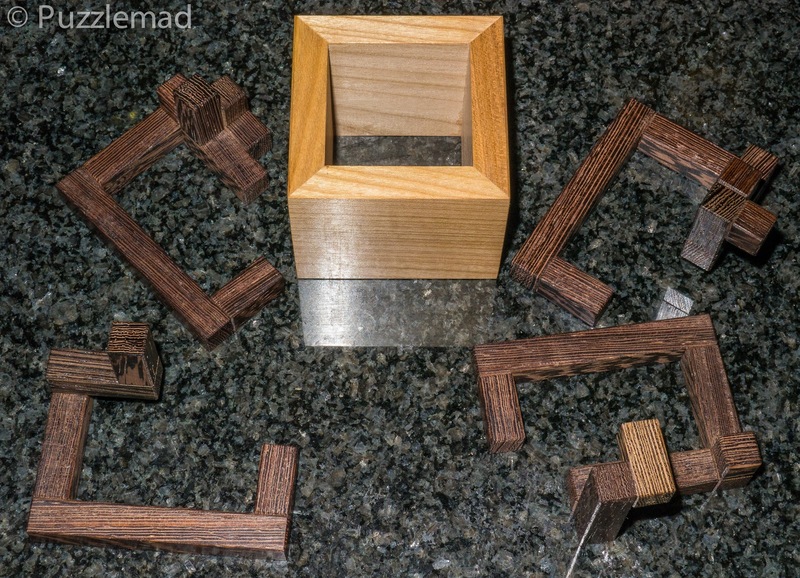 This time, I wanted to showcase the rest of the puzzles I bought in that series. The picture at the top is Box Packing designed by William Hu and it initially confused me because I thought that was the wrong name. I actually thought that the All tetra stick was the Box Packing but Jakub's pictures put me right as did Ishino's site. As soon as I saw the picture I knew I had to have it - it is so different to everything I have seen before. 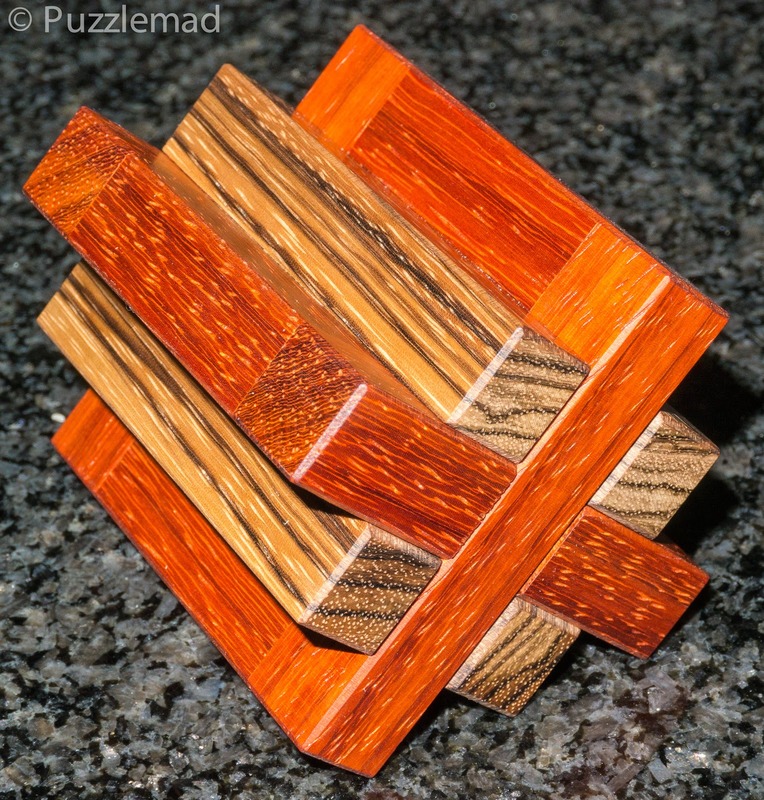 It is sort of a mixture of a burr and a packing puzzle. Beautifully made from Cherry and Wenge, it quickly becomes apparent that a fun little sequence is required to dismantle this one. It doesn't take long to have it in pieces (level 8.4.3.1) and of course take the obligatory photo for blog and database. Not really a packing puzzle but great fun! After mixing them up thoroughly I really struggled to put it back together. I had not memorised the moves or starting positions and unlike many packing puzzles, assembling outside of the box is of no use whatsoever. Eventually after about an hour I managed it with a sigh of relief - this would be quite hard to put into Burrtools. It then occurred to me that inverting it and solving it whilst upside down would be a fun thing to do! 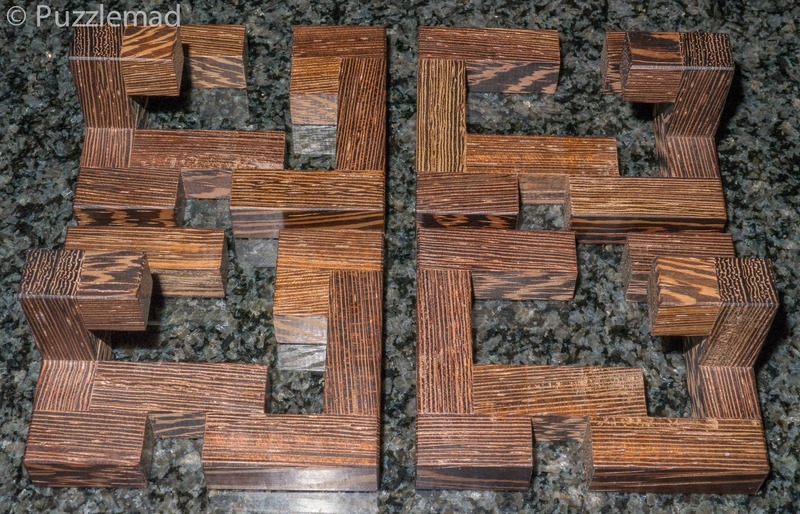 I was right - 2 puzzles effectively for the price of one! My brain was beginning to ache! Luckily the next one I attempted turned out to be much simpler (although still fun). 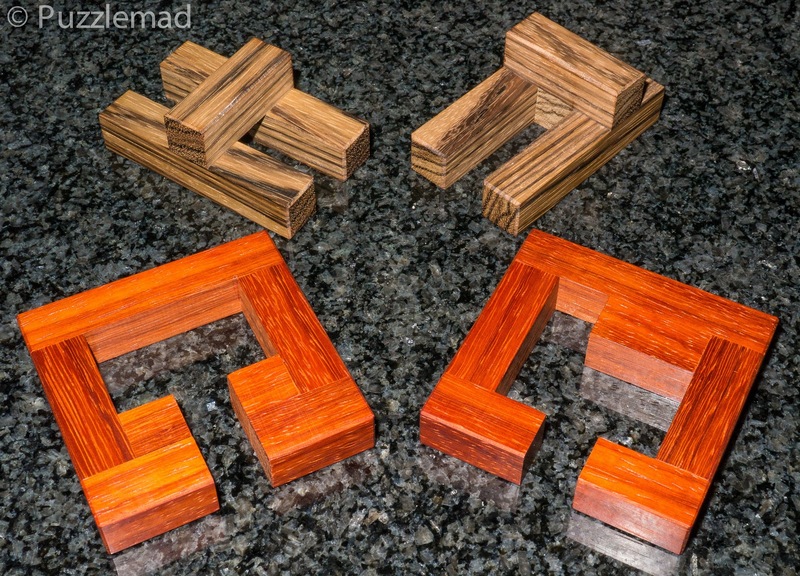 The Stairs cube Designed by Osanori Yamamoto looks stunning in Padauk and Zebra wood. 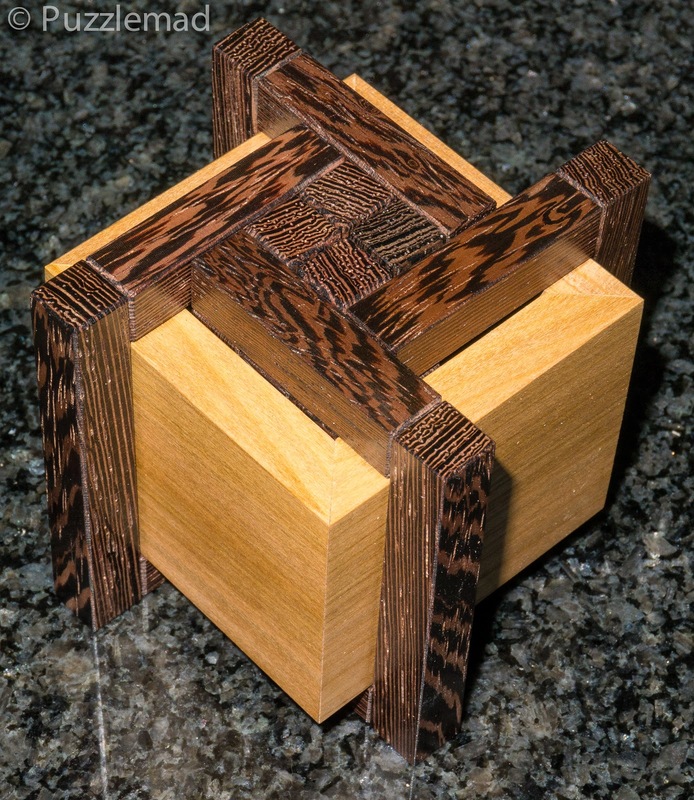 It consists of just 4 pieces and is what Bernhard Schweitzer would call a Turning Interlocking Cube (TIC) after his fantastic series of articles published in the CFF journal. I know they are fantastic because I helped make his English version suitable for publication. A TIC is an interlocking structure that requires rotations to dismantle it and over the last few years the development of this particular group has taken off spectacularly with some fabulous new designs. 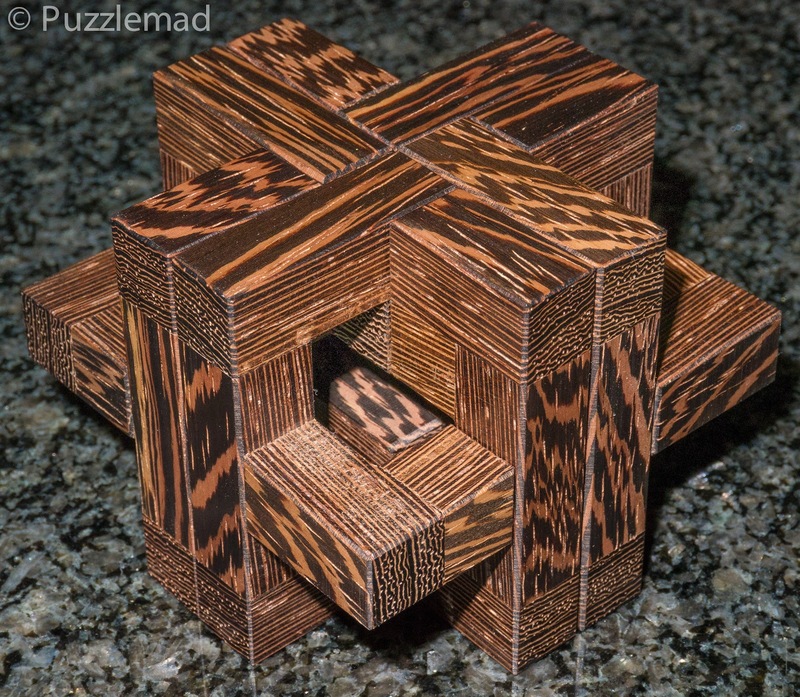 This particular one, even though it's not cubic, is not too challenging but is a fun little diversion and a beautiful example of Jakub's stunning workmanship! I love these exotic woods! The final one in this batch was the Crystal Lattice 1 also designed by Osanori Yamamoto. My version was entirely made in Wenge and with the dark wood it almost looks sinister! This is a board burr - and these have always fascinated me. I still have the Fermium on my shelf above my head taunting me because I cannot solve it! At level 102.95.11 I am not really surprised but it is so beautiful! Rather than individual sticks with notches cut out, a board burr is made from a series of lattices or frames which are interlocked. These are very challenging because the pieces get caught together. My most recent purchase from Alfons Eyckmans is Sandwich and is part made from boards - on the outside it looks just like an 18 piece burr but in reality it is very different! Crystal Lattice 1 is amongst the simpler of board burr designs consisting of just 4 pieces with a nice low level of 14.4.6 but I knew from experience that this would be a tough one! I knew that there was absolutely no way I was going to manage to put this together myself (mainly because I really had no idea what I had done - I did try and failed miserably! So burrtools came to my rescue and it was a nice challenge to get the design drawn up in the program. Next I need to solve one from Jakub that has sat next to me for many months unsolved. Some of my friends have found it fairly easy but I cannot do it - it's the Warped board burr 2 by Yavuz Demirhan. Warped Board Burr - still can't do it! In Europe they are available at good prices from Bernhard Schweitzer at his Puzzlewood site, in N America they all seem to be stocked by Puzzle Master here and Brian & Sue Young stock them at MrPuzzle for those of you in Australasia. Just a reminder - recently I have posted a few updates on my New additions page that you may want to check out. Not in depth reviews but just quick notices of purchases and achievements. That did occur to me when I saw your blog post! But now you get to do it the other way around - 2 puzzles in 1!! Interlocked and even packed successfully!